TAMPA, Fla. -- Lt. Gen. H.R. 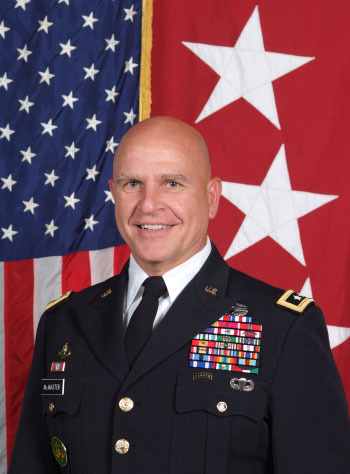 McMaster, who has been called the “architect of the future U.S. Army” and was named one of Time Magazine’s 100 Most Influential People in 2014, will be part of a military forum at the University of South Florida on April 8. McMaster, the director of the Army Capabilities and Integration Center and deputy commanding general at the U.S. Army Training and Doctrine Command, will discuss the future of war and the importance of understanding culture and context. Hosted by USF’s Global Initiative on Civil Society and Conflict, the lecture begins at 1:30 p.m. in the TECO Energy Room located in USF’s College of Education. It’s free and open to the public. As part of the event titled “A Conversation with Lt. Gen. H.R. McMaster: The Importance of the Human Domain,” the noted expert on the future of warfare and military history will join Derek Harvey, director of USF Global Initiative on Civil Society. Harvey is a retired Army Colonel and former senior intelligence analyst for the Defense Intelligence Agency. Lt. Gen. McMaster assumed duties as the director, Army Capabilities and Integration Center and deputy commanding general, futures, U.S. Army Training and Doctrine Command in July 2014. The organization is tasked to think full-time about the next war and how to win it. His combat assignments include Iraq and Afghanistan. He holds a Ph.D. in military history from the University of North Carolina at Chapel Hill and is the author of “Dereliction of Duty,” a book on the roles of the president and military leaders leading to the Vietnam War.